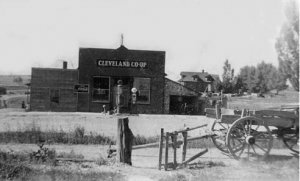 The little town of Cleveland, Utah, seven miles southeast of Huntington, was named in honor of Grover Cleveland, 22nd and 24th president of the United States and who was president at the time. 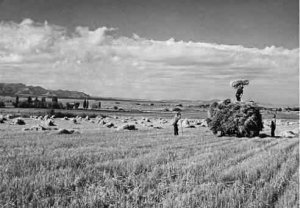 It is located in a swell of land between the mountains and the deserts of Emery County and boasts some of the best and most productive farm ground of the county. Tall green grass, belly high to the horses covered the flats ad hills of this undeveloped area.. In 1884-1885, earlier settlers, arriving, mostly from Northern Utah were primarily LDS and very committed to their religion. Almost at once it became clear that in order to homestead the area, they would have to built a canal to transport water from a distant river to their homes, animals and crops. The canal ran 26 miles up and down hills, through solid rock for a mile and a half and took four and a half years to build at a cost of $30,000. Until it’s completion, culinary water was hauled to Cleveland in barrels from Huntington River or Miller creek, and cattle often had to be driven to the river to be watered. This canal was so well constructed, it is still in use today by Cleveland farmers. In 1890 a reservoir project was proposed and approved to store water for irrigation. This was the first reservoir of its type in this part of the state. Initially settlers lived in dugouts, tents and wagon beds. But new more permanent housing was soon built from logs that were hauled from Huntington Canyon and Cedar Mountain. Early log cabins had sod or dirt roofs and often dirt floors. Many were eventually replaced with more durable frame and brick structures. One of the first brick homes, built by Lars Peter Larsen, still stands today and listed in the National Historical Register. In the late 1800’s dancing was a popular pastime with young and old alike. Popular tunes such as "Turkey in the Straw" and "Don't you See My new Shoes" were often heard at these events. Plays were also held and frequented, and in 1892 a brass band was organized. In 1910 Earnest E. Davis erected a large frame amusement hall that included pool tables, sold confections and was equipped with a stage and curtain. Dramatic companies and Vaudeville shows passing through the area often performed for the residents of Cleveland in this hall. The amusement hall also had the reputation of having the best dance floor in the county. In 1923 a silent picture machine was installed in the hall, and in1928 this machine was exchanged for a talking picture machine. Later the hall become home to a roller skating rink. Other community activities and events included ice skating, bob-sleigh riding in the winter, and large Fourth of July and Twenty-four of July town celebrations in the summer. These celebrations included parades, programs, races, concession, ice cream and sometimes bananas and oranges. A beauty contest called the Goddess of Liberty was also a part of the festivities. Today’s Cleveland Days and Miss Cleveland Pageant have their roots in these original town celebrations. The city of Cleveland built a baseball park in 1918, and the town sponsored an excellent baseball team that won many games against other area teams. Besides baseball Cleveland residents enjoyed rodeos, riding clubs and softball. The children of the early settlers first began attending school in Lister’s stable. In 1890 a one room log cabin was built to serve the communities educational needs. By 1893 another school building was erected and included a small stage for school programs and productions. 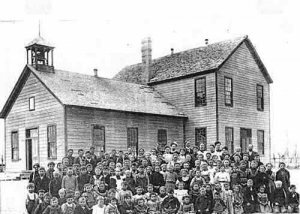 Later a two stories school with one room on each floor was added to meet the growing town’s educational needs. It wasn’t until 1904 that children were segregated into classes according to their age and educational experience, and in1905 the first 8th grade graduation was held. A new schoolhouse built of bricks produced locally took over in 1912, and thought this structure was torn down and replace by a new building in 1976, the original auditorium is still in use. Most Cleveland families were quite self sufficient. Women raised vegetable gardens, grew fruit trees, did most of the milking and made their own butter, cheese, and bread. Meat dishes included mainly venison, rabbit and pork. Cleveland was also the home to a wide variety of small and large business and manufacturing interests. There were shoe makers, rug weavers, cloth spinners, blacksmiths, seamstresses and hat makers. The town included a shingle mill, stable, ice house, bee apiary, saw mill and brick mill as well as the cattle and agricultural trade. Other enterprises such as a malt shop, confectioner, opera house, gas station and machine shop could also be found. In 1889 a hotel was opened and housed a variety of unique and varied guests, but perhaps none as infamous as Butch Cassidy and his notorious gang of outlaws. Drawn to the many hiding places in the surrounding desert area, these men often ma de their way into town and the hotel. According to local residents, they were always very friendly and polite and left generous tips. As a small community, there was no in town doctors or hospitals. If a physician was needed, the closest were located in Price and Huntington. However, Cleveland did have several well trained midwives. The only coffin house in Emery County was in Cleveland. Another inconvenience to the population was the lack of a general store. If a homemaker needed a needle, spool of thread or bar of soap they had to travel 8 miles one way to purchase it. In an effort to address this problem, a cooperative mercantile store was founded in 1892. Some form of this original store was in business until as recently as 1976. A new market now serves the community. Religion played a major part in the lives of the early settlers. The first LDS ward was organized in 1890. At that time, the LDS bishop was given the charge to lead the settlement, and act as judge to settle community arguments and disputes. In 1916 Cleveland was incorporated and appointed a marshal and a justice of the peace to take over these responsibilities. The first marshal was paid ten dollars a month. By the turn of the century Cleveland was a thriving community with wide streets. The swamp was starting to claim some of the farm ground, and Cleveland was beginning to move up on the bench where it now stands. Electricity became available in town by 1929, allowing local home owners to install electric lighting systems. A modern culinary water system that gave access to clean local water through pipe systems was introduced in 1936. With the increase of early automobiles in the 1920’s, Cleveland passed an ordinance making the speed limit in town 12 mph. 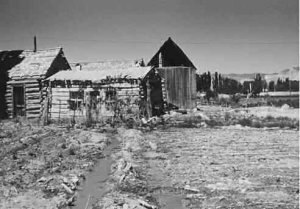 During the 1930's to the 1960's the entire area of Emery County experienced an economic slump that affected most of the town businesses. However, in the seventies and eighties the area experienced an economic boom due to the construction of the Utah Power and Light's electricity generating plants and the coal mines that supply them. The dinosaur beds, located about 8 miles east of Cleveland helped the city gain national attention in 1938. For years ranchers and sheepherders reported finding numerous fossil bones in an area just outside of Cleveland. University of Utah scientists made a preliminary investigation and began digging in 1931. However, this project was abandoned after the summer of 1932. William Lee Stokes and Malcom Lloyd were able to interest Princeton University in the site in 1939, and Lloyd financed a part of the digging. Hence the current name of the site, Cleveland Lloyd Dinosaur Quarry. The quarry is famous for containing a complete allosaurus skeleton, which was excavated, reassembled and put on exhibition at Princeton. Bones and fossils from this quarry are displayed in museums through the world. Located in some of the loveliest terrain in Southern Utah, Cleveland is a popular with outdoor lovers who come from all over to hunt, fish, hike and camp in the area. Yet despite its outside attractions, Cleveland still retains the small town charm its current residents enjoy so well. **This history was created by drawing upon the information of the following noted Cleveland historical writings.